Synopsis: In a time of conflict, a group of unlikely heroes band together on a mission to steal the plans to the Death Star, the Empire’s ultimate weapon of destruction. This key event in the Star Wars timeline brings together ordinary people who choose to do extraordinary things, and in doing so, become part of something greater than themselves. In 2015, audiences went into the future with Star Wars: The Force Awakens. It’s time to venture into the past with Rogue One: A Star Wars Story (Rogue One), in what may be the saddest story ever told in a galaxy far, far away. Rogue One breaks from the normal Star Wars fare with its opening–there is no scrolling dialogue to assimilate the viewer. It aims to be a new beginning of the Star Wars universe audiences know oh so well, and it succeeds in developing its own story line that is separated from any other film in the franchise…almost. Describing Rogue One is difficult because one wrong word choice or reveal of a plot point could ruin the film for viewers. The basic plotline of the film can be revealed, as it’s no big secret. A group of rebels who are fighting Imperial forces, led by the Emperor and Darth Vader, embark on a journey to stop the Death Star. Now, we all know that the Death Star, aka Planet Killer, was indeed completed, and it’s on display in Rogue One. What we don’t know is the story of how it came to be and the scientist behind its creation. Rogue One will explain that fully, and give a bit of extra information. The fact that, as a viewer, you know the end game in Rogue One–that the Death Star exists later in the film’s universe and is eventually destroyed–so the film does not manage to elicit as much excitement or devotion as other franchise installments. The characters are likable, and the latest droid full of sarcastic wit, but as the story unfolds you will undoubtedly feel like you’ve been here before. The sameness of locations, action sequences, spacecraft, and the like, do not provide an opportunity for awe. This is a world you’ve spent a great deal of time in, and there aren’t any great surprises in Rogue One until the very end (even that is, for those who’ve been paying great attention, no big surprise). What the film does do is make you question whether it is in fact a prequel/parallel story to the original Star Wars (now known as Episode IV), or a complete upheaval of the franchise. This is what keeps your interest in Rogue One, because just when you think it’s moving one way it takes a turn and has you questioning everything all over again. 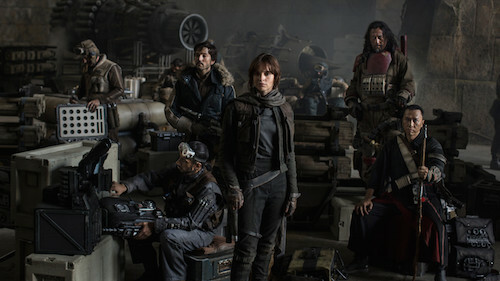 The appearances of all-time favorite characters is also one way Rogue One will definitely have audiences grinning from ear-to-ear–movie magic is being used to its fullest in the film, and successfully. Rogue One should not be missed in theatres for fans of Star Wars. For those considering waiting to see it past opening weekend, that would be a huge mistake. It has far too many things that can be spoiled easily for you, and that’s not something you want to happen. Rogue One gives a new beginning to an old story, and it does so with a ragtag band of non-Jedi’s for a refreshing change of pace. The Force exists, but the Dark Side is much more on display in Rogue One. That alone makes it worth watching, combined with the fact that it’s simply a really fun time at the movies. The action in Rogue One is exceptionally done, and there’s plenty of it to enjoy from beginning to end. And combined with the special effects, which are done with a moderness that mimic’s the original Star Wars’ style, the action does not fail to keep you awake and alert. There are plenty of explosions, on the ground and in the air, and the combat scenes are choreographed with great care. But, do not expect dueling lightsabers–that’s not Rogue One’s style, which is perfectly acceptable because these are rebel forces, not Jedis. For all the ways Rogue One elicits happy action thoughts, it does lack creativity. Many of the action sequences are far too similar to ones seen before in other Star Wars films. One in particular is downright shameful and makes you question whether it was a conscience decision to pay homage to the original film in the series or just lazy storytelling. Regardless, there’s plenty of action to enjoy in Rogue One just try to remember everything’s been done before, so it’s no surprise that creativity has taken a back seat. Has a Star Wars movie ever made you cry? It’s unlikely, unless they were tears of joy. Well, Rogue One is unique because it is the saddest Star Wars ever made, and it just might make you shed a tear or two on multiple occasions. Star Wars movies are meant to end with cries of joy, not tears on your cheeks and a sense of sadness for everyone you’ve just spent two-plus hours with, but that’s Rogue One. There is a happy ending, so to speak, but it doesn’t change the fact that sadness permeates the film. Prepare yourself for an emotional ride, as Rogue One isn’t going to leave you unscathed.